Our Plant Health Care service promotes healthy and attractive landscapes. 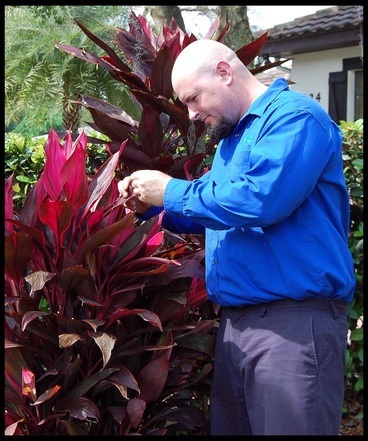 We are familiar with all of the common landscape plants in central Florida. When performing our services we inspect each plant and then apply fertilizer and pest-management products that maximize the potential for that plant. Most plants are fed at least two granular fertilizer applications per year. Many plants, such as palms for example, require more frequent fertilizer applications and extra secondary nutrients. Mature trees that are a part of a typical landscape usually require no supplemental fertilization. Especially since they are taking in some of the nutrients applied to the turf. When appropriate we can recommend our tree micro-injection service. ​All plants are treated based on the "key Plant, Key Pest" concept promoted by the University of Florida. This means no blanket-spraying and instead treating only those specific pests attacking specific plants. Examples of this are treatments for Lace Bugs on Azaleas, and Crape Myrtle Aphids that only attack Crape Myrtles. Plant health care is often much more complicated than turf care. A typical landscape may have 20 or more different varieties of ornamental plants. 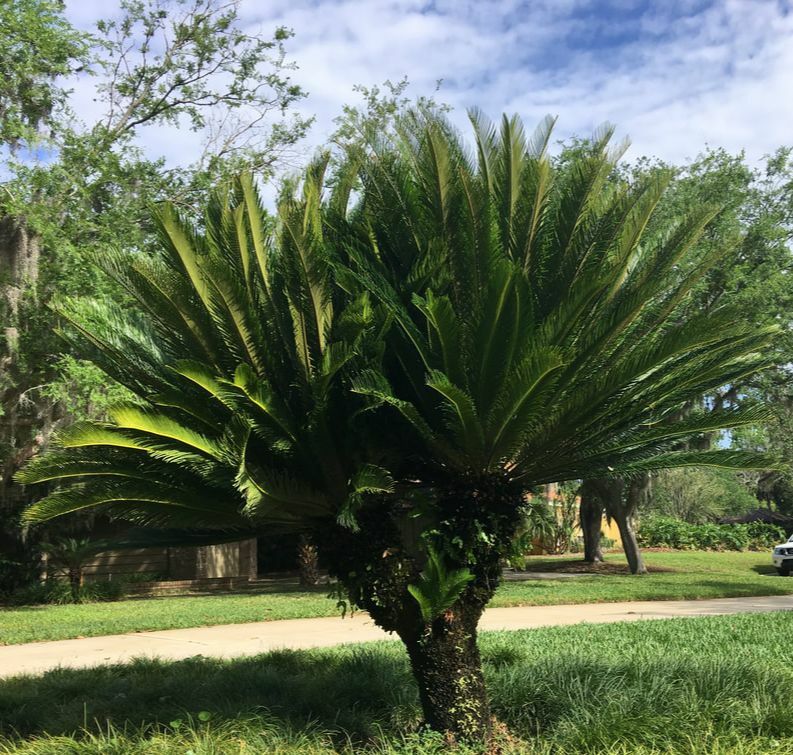 These may include hardwood trees, woody shrubs, palm, cycads, citrus, ground covers, and other accent plants. Each plant variety may have special fertilization and pest-management requirements. 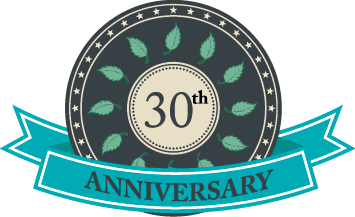 Our service is an excellent alternative to typical "shrub care" programs. We do our part to conserve beneficial insects in the landscapes that we care for. Careful inspection of the landscape for potentially-damaging pests is time consuming and requires extensive technical expertise. While this is not the most economical approach, it is the right thing to do! Horticultural oils are used when possible. These are non-toxic plant sprays that will control pests such as scale, spider mites, aphids, and a number of other plant pests. When other pesticide materials are required, we are very selective about the products that we use. Whenever possible, we use systemic products that are formulated specifically to manage the pest or disease that we target. ​Tulip Scale is a scale insect that often infests Magnolia trees. Left unchecked, it can weaken and even kill the tree. Female scales usually infest stems, while male scales infest underneath leaves as well as stems. Scale insects feed on plant sap. This scale also produces a lot of waste, called honeydew, which in turn introduces black sooty mold. Sooty mold is a fungus that grows on the secreted honeydew. While the fungus does not infect the plant directly, it can interfere with photosynthesis. Systemic insecticides are effective in managing this insect pest. 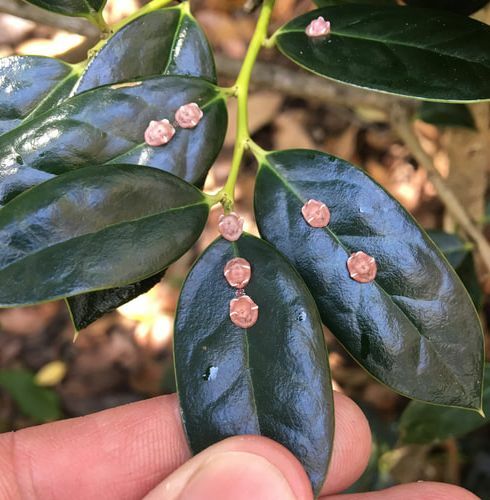 Florida Red Scale is a scale insect commonly seen in Central Florida landscapes. 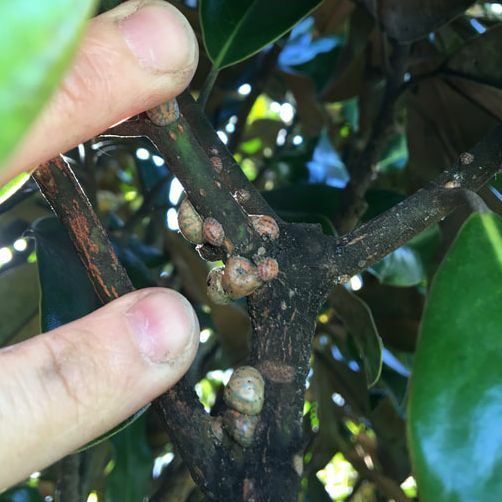 We mostly find this scale on Holly shrubs and trees, but it may infest other landscape plants as well. 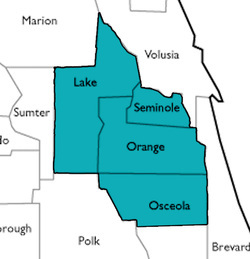 In the 1960s, the Florida Department of Agriculture And Consumer Services (FDACS) published that this scale was eradicated from Florida. Obviously it has rebounded. We look for this scale and other insects pests as part of our Plant Health Care services. Aphids are very common soft-bodied insects that infest most plants. Aphids that infest plants in Central Florida may be green, yellow, gray, or black. 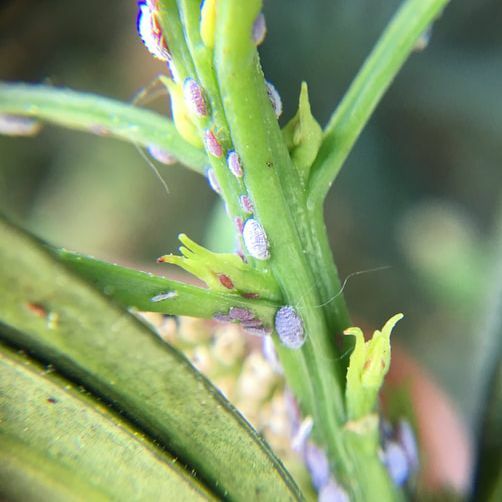 Blue aphids are commonly seen infesting podocarpus. An interesting fact about aphids is that they can reproduce asexually - in fact, aphids seen in spring and summer are usually all females! Aphids feed on plant sap and produce a copious amount of honeydew. Black sooty mold is often seen growing on the secreted honeydew. Aphids are easily managed with contact insecticides. But due to their rapid reproduction rate, populations often rebound quickly. 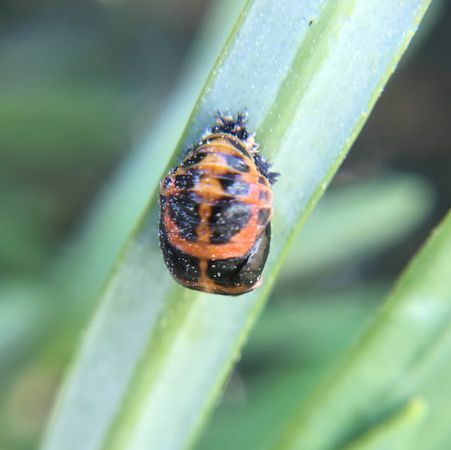 Aphids have many natural predators including Lady Beetles (ladybugs), Lacewings, and parasitic wasps. 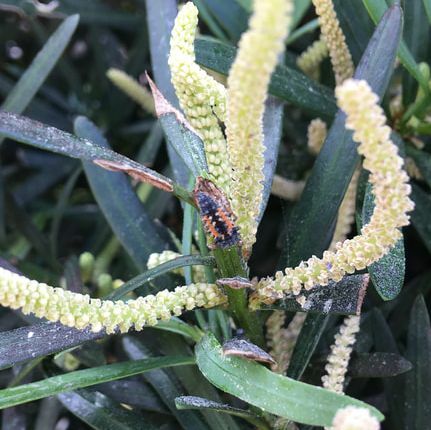 We consider beneficial insects when treating for aphids - if the aphids population is light and beneficial insects provide good control, then we let the beneficials do their job. Whiteflies are actually classified as scale insects. Unlike most scale insects, whiteflies move about rapidly by flying from plant to plant. 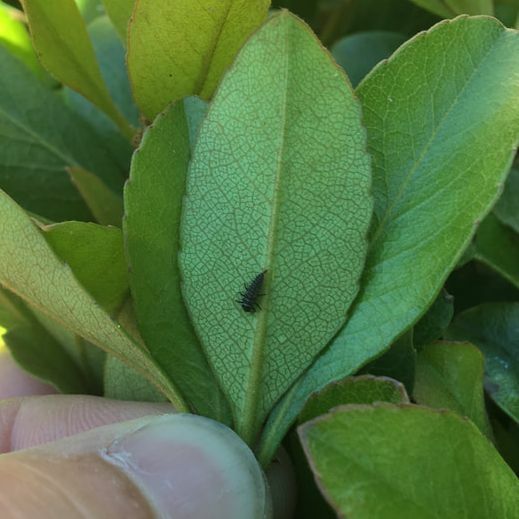 Whiteflies are serious plant pests due to their rapid reprodction and ability to damage plants within a short period of time. In addition, whiteflies are known as vectors of plant viruses. Often, whiteflies management can be difficult. 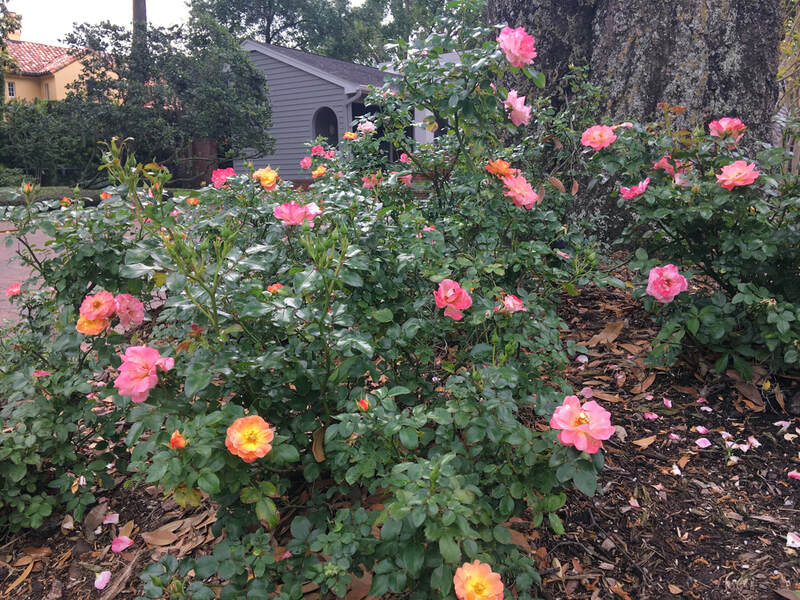 Early diagnosis, treating with different products over time (rotation of active ingredients), and removal of overly-infested plants usually leads to successful control. In addition, good horticultural practices such as correct pruning and encouraging air flow helps in management. 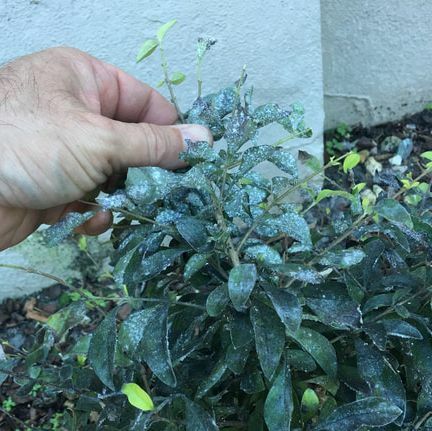 In Central Florida, whiteflies have been particularly troublesome on 'Dew Drop' Duranta.